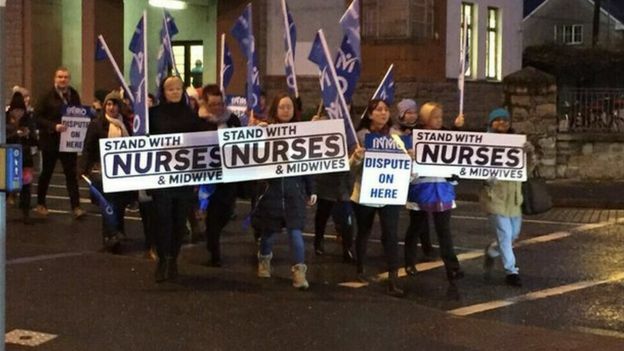 More than 35,000 nurses have gone on strike across the Republic of Ireland in a dispute over pay and staff shortages. The 24-hour strike began at 08:00 GMT on Wednesday. Medical appointments are being disrupted for more than 25,000 patients. 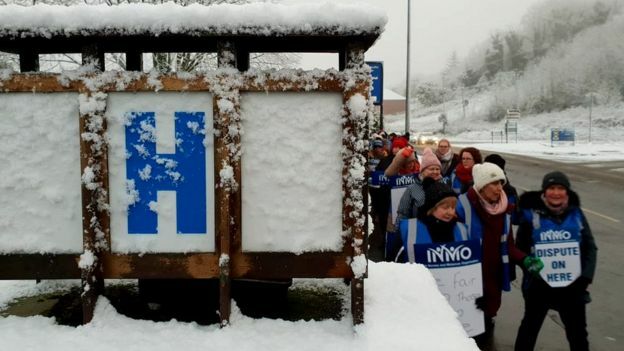 The Health Service Executive (HSE) has put in place contingency plans to try and minimise cancellations. On Tuesday, the Labour Court said it would not be intervening in the row following talks between the HSE and the Irish Nurses and Midwives Organisation (INMO). The unions argue a pay rise is needed to recruit and retain staff, but the Irish government maintains that the 300m euros (£260m) it would cost is unaffordable. The INMO says that staffing challenges can only be addressed with an across the board pay rise, bringing them in line with other graduate health professionals. However, the Irish government says it would trigger knock-on claims and undermine economic security as Brexit looms. It also defended the current terms and conditions of nurses and midwives. Asked whether the government will move to penalise INMO members for breaching the public service pay agreement by striking, the Department of Public Expenditure and Reform said that was under legal consideration. The HSE has said that 13,000 hospital outpatient appointments and 2,000 surgeries will be cancelled. A further 10,400 appointments at community care services will be postponed. However, planned cancer surgery will go ahead as will disability services in residential units, while emergency departments will operate with reduced staff levels. There are also strikes planned for 5 and 7 February, and then on the 12, 13 and 14 February. Dr Emily O’Connor told Irish national broadcaster RTÉ that “about 3,500 to 4,000 patients” attend emergency departments at Irish hospitals every day. “So there’s a lot of concerns that we won’t have enough nurses and that in particular we won’t have a nurse to triage patients as they come into the emergency department. An advocacy group for patients with leukaemia has warned that lives will be put at risk by the strike. In a Twitter post, Chronic Lymphocytic Leukaemia Ireland described it as a “dark day for patients, nurses and all health care providers”.